Did the Flash Save Comics? This essay was originally posted on K-Squared Ramblings in 2008. When the New York Daily News broke the news about Barry Allen’s return, they brought up the hero’s key role in launching the Silver Age of Comics. Superheroes had fallen out of favor in the early 1950s, and comics were exploring genres like westerns, horror, romance, etc. When DC successfully relaunched the Flash in 1956, there was an explosion of new super-hero titles. I don’t think that’s precisely true. Not to discount Barry’s contribution—it’s entirely possible, even likely, that super-heroes would have remained a background genre. But for one thing, we’re looking at half a century of ephemeral pop culture. For another thing, let’s consider: why were comics going after the western, crime and horror genres when super-heroes failed? Because that’s what was popular in movies and television at the time. I’d guess that, without the Flash revitalizing super-heroes, we would have seen more science-fiction comics in the 1960s, more police comics in the 1970s, sitcom comics in the 1980s, and so on. Comics genres would probably have followed along with trends in pop culture instead of becoming heavily focused on a single genre. We wouldn’t be reading cowboy comics today; we’d be reading reality comics. Eh, who knows? Maybe they’d be all about pirates. This entry was posted in Flash History and tagged Barry Allen, Repost, Silver Age, Speculation on November 30, 2010 by Kelson. Today’s guest post is by Brandan of Speedster Site. What does it take to make a character memorable? Is that what it takes to make a character iconic? When DC Comics announced that writers Geoff Johns and Joe Michael Straczynski would be writing 100+ pages each about Batman and Superman respectively, I couldn’t have been happier. I immediately thought that this “The Perfect Chance”. Johns and Straczynski are writing Batman: Earth One and Superman: Earth One. Two original graphic novels that have their own unique spin on DC’s icons. Why was this the perfect chance though? Simply because DC Comics has about 7 specific characters that could thrive under this type of release. 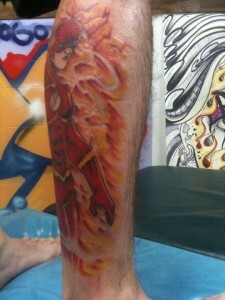 Of course the most important of those I’m speaking of is our favorite hero, The Flash! Let us look at the math of this perfect chance. One of the most recognized characters in comics, plus a symbol that’s known to many outside of comics, subtracting the monthly wait and occasional artist deadline rush, adding a highly capable artist, and to top it all off, its over 100 pages of new content. I was never good at math, but I am pretty sure that equals a sure fire success story. But why The Flash? I know what you’re thinking. “Surely you must be happy with the relaunch of the series, and excited about the upcoming Flashpoint event. Why waste time on 100 pages of Flash?” Why? Because while that first issue of Geoff Johns and Francis Manapul’s The Flash may be new comic reader friendly, its not going to bring in more readers like The Flash: Earth One could. Still not convinced? Well how about the idea of a Barry Allen story that defines the character you have come to love and respect? Yeah, I thought that might change your mind. This entry was posted in Opinion and tagged Earth One, Grant Morrison, Guest Posts, Ryan Sook on November 29, 2010 by Guest Blogger. 20 Things I Learned About Browsers and the Web is a fun illustrated guidebook from Google. Marc Guggenheim talks Halcyon, Action Comics and More at Bleeding Cool. Children’s book: Wrath of the Weather Wizard coming in January. @liabrown1 points out that there are more Rogues/Flash kids’ books coming out soon. That F’ing Monkey describes some Flash merchandise he wishes existed. This entry was posted in Round-Ups and tagged Linkblogging on November 27, 2010 by Kelson. DC should plan for the book to get delayed. I really like Francis Manapul’s art, and Geoff Johns, when he’s at the top of his game, can be a great writer. I’d rather not lose this team on the book right now. 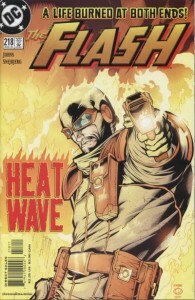 But it’s been a while since The Flash managed to release twelve issues a year. To catch up, they’ve planned a couple of Rogue Profiles before the next story arc: done-in-one issues that tie into the ongoing mythology but focus on a different point of view, namely one of the Flash’s villains. These were great during Geoff Johns’ run on the Wally West Flash series, and I’m glad we’re seeing more. Meanwhile, the pacing of the series seems a little bit more decompressed than it needs to be. As much as I enjoyed it, “The Dastardly Death of the Rogues” felt like it could have been told as effectively in four or five parts instead of six. Flash: Rebirth definitely could have – it seemed like half of the final issue was epilogue. But six issues is the standard length for a collection, so that seems to be the story length that they’re shooting for. My suggestion: Make the story arcs five issues long instead of six, and schedule a Rogue Profile in between. Put another artist on the profile, one suited to the villain getting the spotlight. If Geoff Johns is busy, let another writer work from his outline, or hand it outright to someone who understands the current take on the Rogues. This entry was posted in Opinion and tagged Delays, Francis Manapul, Geoff Johns, Rogues on November 23, 2010 by Kelson. With issue #3 coming out in a couple of weeks (December 8, the same week as the next issue of The Flash), Top Cow has released the first issue of the Velocity miniseries online…free! 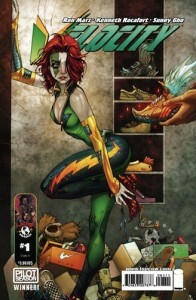 You can read the full issue at Newsarama. UPDATE: CBR’s copy of the issue is larger, making it easier to read the yellow-on-green text. This entry was posted in Other Speedsters, Timely and tagged Velocity on November 23, 2010 by Kelson.